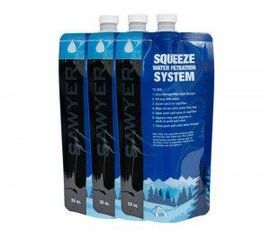 SAWYER SP113 - set de 3 pungi/rezervor de 1Litru pentru filtrele SAWYER MINI si SAWYER SQUEEZE. Se pot umple cu apa din rauri, lacuri, fantani sau direct de la robinet, apoi se ataseaza la unul din filtrele SAWYER. Aceste pungi sunt din material flexibil, rezistent, se pot impacheta foarte usor pentru transport. - Sawyer SP113 is a set of three x 1 litre (32 ounce) pouches to use with your Sawyer Squeeze or Sawyer MINI Water Filters. - The SP113 Sawyer pouches can be filled in any lakes or rivers, or under faucets. - The Sawyer SP113 attaches directly to the tapered Sawyer water filter to filter the drinking water. - These Sawyer SP113 pouches can be collapsed and rolled up for portability.